Several Israeli army jeeps invaded, on Monday at night, the town of Teqoua’, southeast of the West Bank city of Bethlehem, searched homes and abducted a young man. Media sources in Bethlehem said the soldiers invaded the town from several directions, before storming and ransacking homes. They added that the soldiers abducted a young man, identified as Mohammad Shibli Sha’er, from his home in the town. In addition, several young men hurled stones, and used fireworks against the invading armored military jeeps. 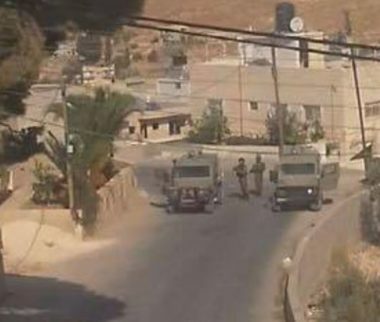 In related news, the soldiers invaded Magharat ad-Dab’ah village, south of Qalqilia, and the Eastern Area of Nablus city, in the northern parts of the occupied West Bank.